The Catacombs of Paris (Catacombes de Paris) are underground ossuaries in Paris, France, which hold the remains of more than six million people in a small part of a tunnel network built to consolidate Paris' ancient stone mines. Extending south from the Barrière d'Enfer ("Gate of Hell") former city gate, this ossuary was created as part of the effort to eliminate the city's overflowing cemeteries. Preparation work began not long after a 1774 series of gruesome Saint Innocents-cemetery-quarter basement wall collapses added a sense of urgency to the cemetery-eliminating measure, and from 1786, nightly processions of covered wagons transferred remains from most of Paris' cemeteries to a mine shaft opened near the Rue de la Tombe-Issoire. 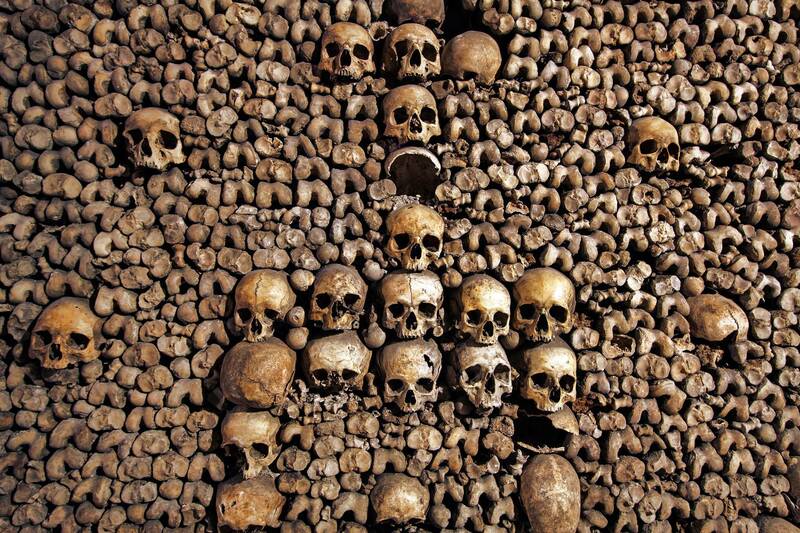 The ossuary remained largely forgotten until it became a novelty-place for concerts and other private events in the early 19th century; after further renovations and the construction of accesses around Place Denfert-Rochereau, it was open to public visitation from 1874. Since January 1, 2013, the Catacombs number among the 14 City of Paris Museums managed by Paris Musées. Although the ossuary comprises only a small section of the underground "carrières de Paris" ("quarries of Paris"), Parisians presently often refer to the entire tunnel network as "the catacombs". Paris' earliest burial grounds were to the southern outskirts of the Roman-era Left Bank city. In ruins after the Roman empire's 5th-century end and the ensuing Frankish invasions, Parisians eventually abandoned this settlement for the marshy Right Bank: from the 4th century, the first known settlement there was on higher ground around a Saint-Etienne church and burial ground (behind the present Hôtel de Ville), and urban expansion on the Right Bank began in earnest after other ecclesiastical landowners filled in the marshlands from the late 10th century. Thus, instead of burying its dead away from inhabited areas as usual, the Paris Right Bank settlement began with cemeteries near its centre. The most central of these cemeteries, a burial ground around the 5th-century Notre-Dame-des-Bois church, became the property of the Saint-Opportune parish after the original church was demolished by the 9th-century Norman invasions. When it became its own parish associated with the church of the "Saints Innocents" from 1130, this burial ground, filling the land between the present rue Saint-Denis, rue de la Ferronnerie, rue de la Lingerie and the rue Berger, had become the City's principal cemetery. By the end of the same century "Saints Innocents" was neighbour to the principal Parisian marketplace Les Halles, and already filled to overflowing. To make room for more burials, the long-dead were exhumed and their bones packed into the roofs and walls of "charnier" galleries built inside the cemetery walls. By the end of the 18th century, the central burial ground was a two metre high mound of earth filled with centuries of Parisian dead, plus the remains from the Hôtel-Dieu hospital and the Morgue; other Parisian parishes had their own burial grounds, but the conditions in Les Innocents cemetery were the worst. A series of ineffective decrees limiting the use of the cemetery did little to remedy the situation, and it was not until the late 18th century that it was decided to create three new large-scale suburban burial grounds on the outskirts of the city, and to condemn all existing parish cemeteries within city limits. Much of the Left Bank area rests upon rich Lutetian limestone deposits. This stone built much of the city, but it was extracted in suburban locations away from any habitation. Because of the post 12th-century haphazard mining technique of digging wells down to the deposit and extracting it horizontally along the vein until depletion, many of these (often illicit) mines were uncharted, and when depleted, often abandoned and forgotten. Paris had annexed its suburbs many times over the centuries, and by the 18th century many of its arrondissements (administrative districts) were or included previously mined territories. The undermined state of the Left Bank was known to architects as early as the early 17th-century construction of the Val-de-Grâce hospital (most of its building expenses were due to its foundations), but a series of mine cave-ins beginning 1774 with the collapse of a house along the "rue d'Enfer" (near today's crossing of the Avenue Denfert-Rochereau and the boulevard Saint-Michel) caused King Louis XVI to name a commission to investigate the state of the Parisian underground. This resulted in the creation of the inspection Générale des Carrières (Inspection of Mines) service. The need to eliminate Les Innocents gained urgency from May 31, 1780, when a basement wall in a property adjoining the cemetery collapsed under the weight of the mass grave behind it. The cemetery was closed to the public and all intra muros burials were forbidden after 1780. The problem of what to do with the remains crowding intra muros cemeteries was still unresolved. Mine consolidations were still occurring and the underground around the site of the 1777 collapse that had initiated the project had already become a series of stone and masonry inspection passageways that reinforced the streets above. The mine renovation and cemetery closures were both issues within the jurisdiction of the Police Prefect Police Lieutenant-General Alexandre Lenoir, who had been directly involved in the creation of a mine inspection service. Lenoir endorsed the idea of moving Parisian dead to the subterranean passageways that were renovated during 1782. After deciding to further renovate the "Tombe-Issoire" passageways for their future role as an underground sepulchre, the idea became law during late 1785. A well within a walled property above one of the principal subterranean passageways was dug to receive Les Innocents' unearthed remains, and the property itself was transformed into a sort of museum for all the headstones, sculptures and other artifacts recuperated from the former cemetery. Beginning from an opening ceremony on 7 April the same year, the route between Les Innocents and the "clos de la Tombe-Issoire" became a nightly procession of black cloth-covered wagons carrying the millions of Parisian dead. It would take two years to empty the majority of Paris's cemeteries. Cemeteries whose remains were moved to the Catacombs include Saints-Innocents (the largest by far with about 2 million buried over 600 years of operation), Saint-Étienne-des-Grès (one of the oldest), Madeleine Cemetery, Errancis Cemetery (used for the victims of the French Revolution), and Notre-Dame-des-Blancs-Manteaux. 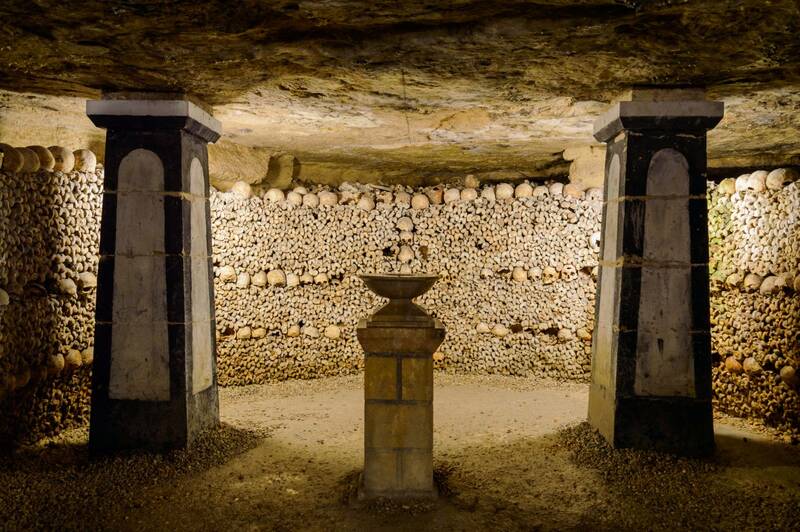 The catacombs in their first years were a disorganized bone repository, but Louis-Étienne Héricart de Thury, director of the Paris Mine Inspection Service from 1810, had renovations are done that would transform the underground caverns into a visitable mausoleum. In addition to directing the stacking of skulls and femurs into the patterns seen in the catacombs today, he used the cemetery decorations he could find (formerly stored on the Tombe-Issoire property, many had disappeared after the 1789 Revolution) to complement the walls of bones. Also created was a room dedicated to the display of the various minerals found under Paris, and another showing various skeletal deformities found during the catacombs' creation and renovation. He also added monumental tablets and archways bearing inscriptions (that some found questionable) that were warnings, descriptions or other comments about the nature of the ossuary, and, for the safety of eventual visitors, it was walled from the rest of the Paris's Left Bank already-extensive underground tunnel network. The Catacombs of Paris became a curiosity for more privileged Parisians from their creation, an early visitor being the Count of Artois (later Charles X of France) during 1787. Public visits began after its renovation into a proper ossuary and the 1814 – 1815 war. First allowed only a few times a year with the permission of an authorized mines inspector, but later more frequently and permitted by any mine overseer, a flow of visitors degraded the ossuary to a point where the permission-only rule was restored from 1830, and the catacombs were closed completely from 1833 because of church opposition to exposing human remains to public display. Open again for four visits a year from 1850, public demand caused the government to allow monthly visits from 1867, bi-weekly visits on the first and third Saturday of each month from 1874 (with an extra opening for the November 1 toussaint holiday), and weekly visits during the 1878, 1889 (the most visitors yet that year) and 1900 World's Fair Expositions. Later they opened for regular daily visits. After an incident of vandalism, the Catacombs were closed to the public during September 2009 and reopened on 19 December of the same year. Les Catacombes | eTips Inc.